“Our signature dish! Experience the Chili Half-Smoke, originally made famous by Ben’s in 1958 and a favorite of Mr. Cosby’s since the early 60’s. We put this 1/4lb. half pork and beef smoked sausage on a warm steamed bun and top it with mustard, onions and our spicy homemade chili sauce. Simple, yet so damn good! I usually like my hotdog with chili and cheese, but even though this didn’t have cheese, it was amazing and actually I didn’t even miss it! It was simple, flavorful and perfect! I loved the sausage instead of just a regular hot dog too. It was thicker and juicier and had good flavor. The chili was the perfect texture (not chunky) with a smokey flavor and had a little bit of a spicy kick to it. I loved the chili mixed in with the mustard and the onions gave it a crunch. It all just worked! Great chili dog! Can’t go wrong with chili cheese fries. I already loved the chili, so mixed with nacho cheese is my heaven! Dirty and messy but so good. 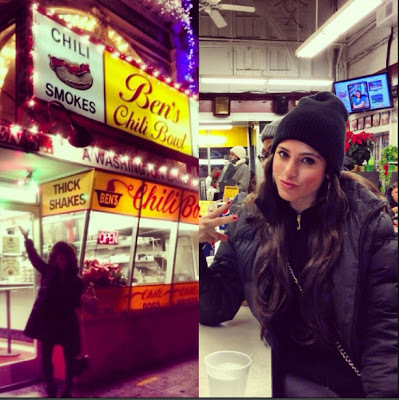 If you really like grub food, I don’t think you can’t get much better than this!I would definitely go back to Ben’s Chili Bowl next time I’m in Washington DC. It’s a must-go if you are there because of its history. The chili was great and they have plenty of other items on the menu I need to try! Be prepared to get down and dirty! It gets messy lol.